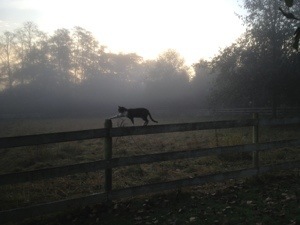 It’s amazing how Rosa (one of the rescued cats from Mexico) doesn’t stroll or saunter along the top rail of the fence. She marches, steps out like she has a whole empty highway beneath her. Next time I feel hesitant, worried about safety nets, or unsure about taking the next step, I’m going to think about Rosa who has adapted so well to her new life here and strides forward like she owns the… fence. This entry was posted in Blog, Uncategorized and tagged Cat, farm. Bookmark the permalink.